(The following diagram illustrates the explanations given below). between the meridian of the observer and the meridian of the geographical position of the celestial body. Due to the Earth’s rotation, the Sun moves through 15o of longitude in 1 hour and it moves through 15 minutes of arc in 1 minute of mean time. 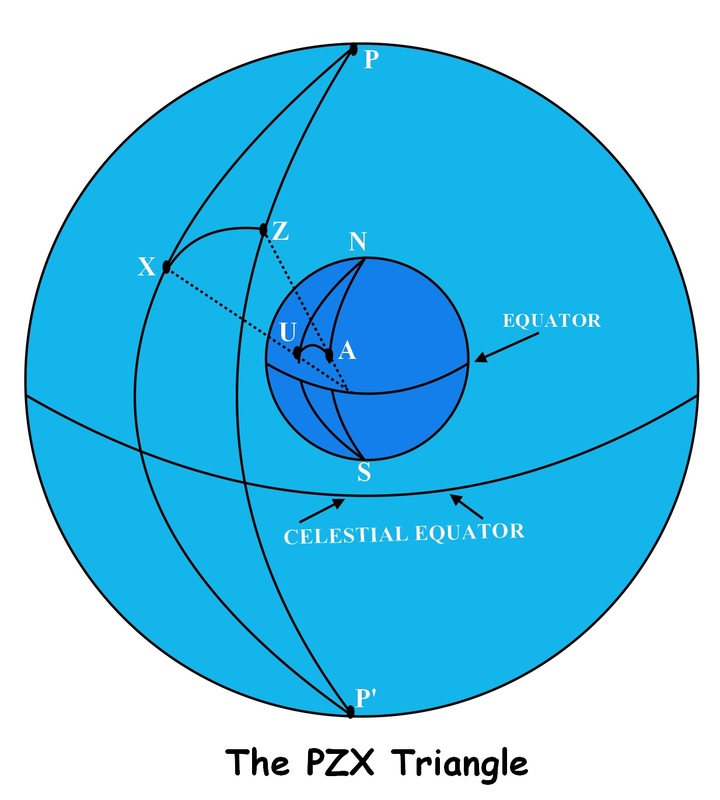 So the angle ZPX can be measured in terms of time and for this reason, it is known as the Local Hour Angle. Greenwich Hour Angle (GHA). The hour angle between the Greenwich Meridian and the meridian of a celestial body is known as the Greenwich Hour Angle. The Local Hour Angle between an observer’s position and the geographical position of a celestial body can be found by combining the observer’s longitude with the GHA. This is demonstrated in the following diagram. Because, in this case, the observer’s longitude is east and because LHA is measured westwards from the observer’s meridian to the meridian of the celestial body, LHA is equal to the GHA plus the longitude. Long East, LHA = GHA + LONG (-360o as necessary). Calculating the Greenwich Hour Angle. 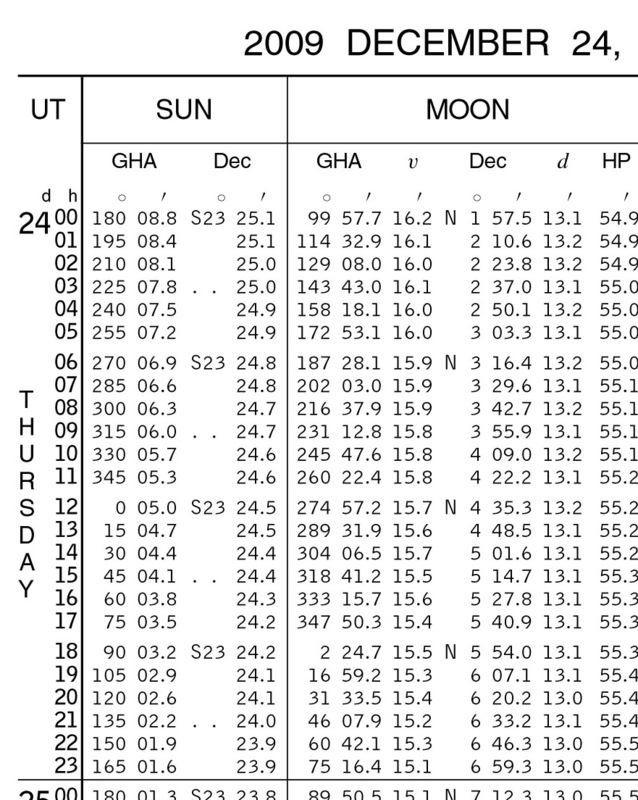 The Nautical Almanac contains tables of raw data concerning the Greenwich Hour Angle for the Sun, the Moon, the navigational planets and selected stars. Example 1. To find the LHA and Declination of the Sun. At 04 hours, 32 minutes, 04 seconds GMT on 24 December 2009, the assumed position of your yacht is 40o 35.5’ South 32o 13.8’ East. Find the LHA and Declination of the Sun. Calculating the Local Hour Angle (LHA). 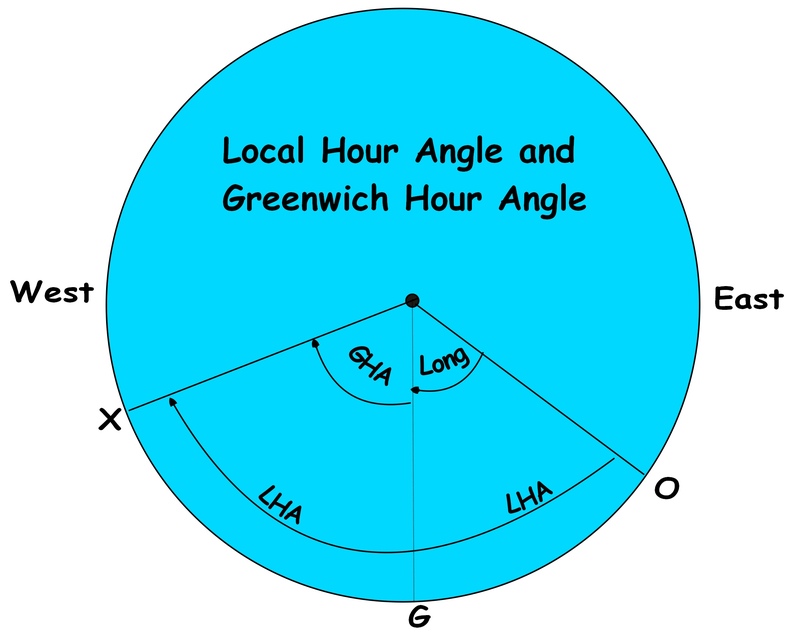 Before we can calculate the LHA, we need to find the Greenwich Hour Angle of the Sun. Step 2. Calculate the increment for 32 minutes, 04 seconds: In this step, we find the increase in GHA for minutes and seconds of GMT. 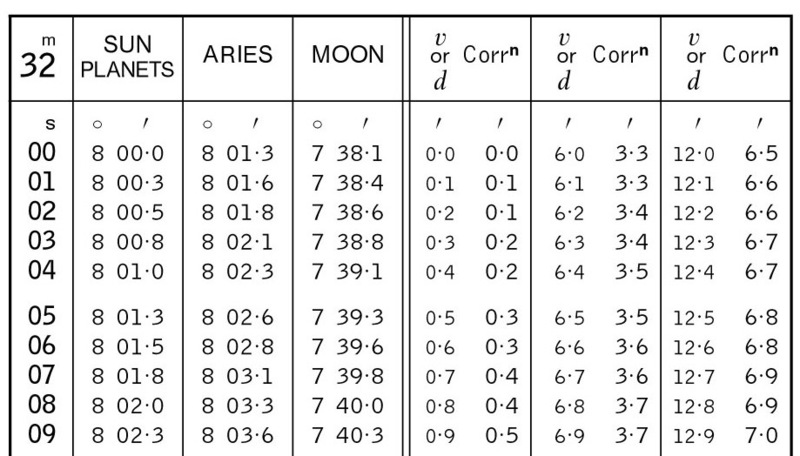 The Nautical Almanac contains tables of corrections for increments of time from 0 minutes to 59 minutes. The following extract shows the increments and corrections tables for 32 minutes. Note. Since GHA is always increasing, the increment correction is always added. Note. Units of this course are issued weekly.